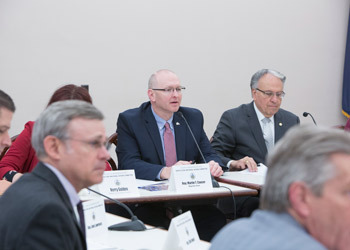 As chairman of the House Agriculture and Rural Affairs Committee, Rep. Martin Causer (R-Cameron/McKean/Potter) led an informational meeting at the state Capitol to discuss House Bill 915, legislation that would exempt milk trucks from weather-related commercial vehicle travel bans. HARRISBURG – Dairy farmers, milk haulers and public safety officials appeared before the House Agriculture and Rural Affairs Committee Wednesday to discuss legislation introduced by Rep. Martin Causer (R-Cameron/McKean/Potter) that would exempt milk trucks from weather-related commercial vehicle travel bans. Causer said the meeting gave the dairy farmers and milk haulers the opportunity to share their experiences and concerns not only with the members of the committee but also with state officials who are involved in making the decisions about issuing travel bans. Among the speakers at Wednesday’s meeting were dairy farmers Keith Spicher of Mifflin County and Mervin Horst of Lebanon County. Both spoke of the fact that “you don’t just turn cows off” when it comes to milk production and stressed the importance of being able to have their milk delivered promptly, not only because the cows are still producing milk but also because the countdown to the expiration date consumers see at the grocery store starts as soon as the milk leaves the cow. Spicher also stressed that milk haulers tend to be better equipped and have more experience handling their large trucks in difficult situations, spending plenty of time driving off of paved roads and on country roads and farm lanes. Four milk haulers from central and northeastern Pennsylvania also talked about their experiences in difficult driving conditions and stressed their concern that pushing the large vehicles off the interstate and on to local roads that are not plowed or treated nearly as frequently creates more of a safety hazard. Officials from the Pennsylvania Department of Transportation, Pennsylvania State Police and Pennsylvania Emergency Management Agency shared information and took questions from committee members about the process they go through when assessing the threat of winter weather. They pointed to past storms that have left motorists stranded for hours on end as one reason for the commercial vehicle travel bans. Commercial vehicles are more likely to block traffic and are more difficult and time consuming to remove from the roadways. However, they also acknowledged the impact such bans can have on commercial traffic. “This was a very informative session, and I think all involved are interested in working together to find a solution that protects public safety without overburdening our dairy farmers or milk haulers,” Causer said. Causer introduced his legislation, House Bill 915, in response to the Wolf administration issuing a disaster emergency declaration this winter in which commercial vehicles were banned three times from some portions or all of the state’s interstate highways in anticipation of snow or ice accumulations. Video of the meeting will be posted at RepCauser.com when available.